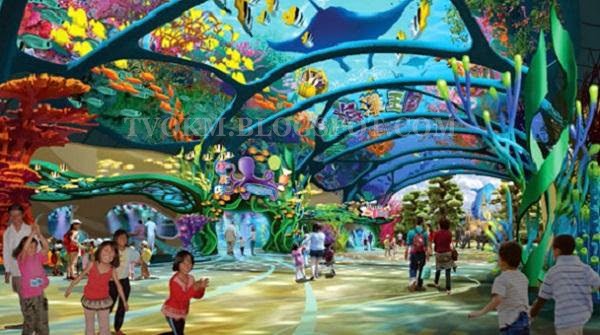 An aquarium in China appears to be the largest marine theme park in the world with an area of ​​132 hectares, the construction cost as much as 484.4 million pounds (RM2.6 billion). The Chimelong Marine Park that stores 22.7 million liters of salt water, also sets a new world record for its biggest exhibition of fitted tank, aquarium tank, aquarium windows and acrylic display panel. The new tourist attraction opened to public on Saturday, is part of the Chimelong Hotel Hengqin Bay, which labeled as the largest marine ecology in the country. Chimelong Ocean Park, located on Macau Hengqin Island, took three years to complete and has seven theme parks and each one represents a part of the ocean. It is also equipped with a five-dimensional cinema and circus. The park was designed by GAV Destinations, which was also responsible for designing the Hong Kong Grand Aquarium and the Museum of Terracotta Warriors in Xian. Over 1.98 billion pounds (RM10.76 billion) has been invested to build a hotel and a theme park owned by Chime-Long Group, which also owns the erstwhile largest theme park in China, Chime-Long Paradise in Guangzhou. On the pre-opening ceremony held on the New Year in January this year, the park welcomed over 500,000 visitors.